As we’ve expanded our product lines in recent months, we’ve also expanded the number of CoQ10 supplements that we carry. After getting numerous questions about our different CoQ10 products, we realized that while most people have heard of CoQ10, not everyone may be aware of all of the great things that CoQ10 can do for your body, from cardiovascular health to antioxidant creation. So, what is CoQ10, anyway? CoQ10 (short for CoenzymeQ10) is a vitamin-like antioxidant that’s present in every cell of your body. It’s found in the mitochondria (the “power plants” of cells), and is responsible for generating the energy that your cells use to perform their important functions. Because it’s responsible for your cells’ energy production, the organs that have the highest energy requirements, such as your heart, liver and kidneys, also have the highest concentrations of CoQ10. CoQ10 was first discovered in 1957, when scientist Frederick Crane synthesized it from the mitochondria in beef heart cells. Peter D. Mitchell won the Nobel Prize in 1978 for his work in figuring out how cells create energy using CoQ10. Needless to say, this has been a well-studied molecule, as it’s also been shown to be low in patients with heart conditions, cancer, muscular dystrophies, Parkinson’s and many other diseases. CoQ10 may also play a role in preventing and reducing the severity of headaches, boosting male fertility and treating the symptoms of gum disease. CoQ10 is most used to support cardiovascular health, such as assisting in maintaining good cholesterol, reducing high blood pressure and supporting the health of vessel walls. It has also been shown to improve chest pain in patients with angina. CoQ10 supplementation is also extremely important for people taking statins to lower their cholesterol. Because CoQ10 and cholesterol are synthesized from the same substance in your body, taking statins to block cholesterol creation also blocks CoQ10 creation, so it’s especially important for people taking these drugs to get extra CoQ10. On top of all that, CoQ10 also has powerful antioxidant properties, because it gives up its electrons to other antioxidants (such as Vitamin E and C) that have already been used up, and helps power them back up so they can continue to fight oxidation in cells (just like our good friend Glutathione!). Because of its antioxidant properties, CoQ10 is also used in skin creams and supplements to keep skin looking vibrant and youthful. CoQ10 comes in two forms: Ubiqionol and Ubiquinone (so named for its ubiquity in the cells of living organisms). Ubiquinol is the active form that your body can use right away to fight free radicals and synthesize energy. Ubiquinone is the oxidized form that your body converts to Ubiquinol. When choosing a CoQ10 supplement, look for one that gets its CoQ10 from Ubiquinol so that your body can use it more readily. While there isn’t a set recommended daily value for CoQ10, most practitioners recommend taking around 100mg of CoQ10 per day in order to maintain a healthy cardiovascular system, and more may be needed if you’re taking statins, or have a family history of heart problems. There is no known toxicity with very high doses of CoQ10, and daily doses up to 1,200 mg per day are recommended with no known side effects. Some studies have shown that daily doses of up to 3,600 mg per day are safe, but can cause some gastrointestinal discomfort. Since CoQ10 is a fat-soluble molecule, it’s important to take with a meal that contains olive oils or other fats, or with any oils you might be taking, such as fish oil or flaxseed oil. Pharmax Chewable CoQ10: This chewable provides 60 mg of CoQ10 in a blackcurrant-flavored chewable, for those who don’t like to swallow a lot of pills. Pharmax Finest Pure Fish Oil with CoQ10: This premium-grade fish oil is naturally processed to maintain the highest levels of EPA and DHA possible, while eliminating any fishy taste. Flavored with sweet orange oil, this fish oil tastes great while also providing 1,960 mg of Omega-3 fatty acids and 50 mg of CoQ10. Because the CoQ10 is dissolved in the fish oil, it provides maximum solubility in just 1 teaspoon a day. Metabolic Maintenance CoQ10 Powder: Each scoop of this powder provides 100 mg of CoQ10 in a great-tasting, easy-to-use powder that can be mixed with water or juice for easy and flexible dosing. Innate Response CoQ10: Each capsule provides 100 mg of CoQ10 from whole-food sources, along with complementary whole-food extracts that help boost its antioxidant properties. Hate Swallowing Pills? Try Our Newest (Delicious) Gummy Vitamins! When we started selling our line of Nature’s Dynamics gummies, we had no idea how popular they’d be. Not only are they organic and made from whole foods, but they taste absolutely awesome. Who knew so many people hated swallowing pills? So, it’s no surprise that we’re especially excited about the newest additions to their line of chewable and gummy vitamins and supplements for grown-ups (and kids. And dogs!). Check out these three new products, and, while you’re at it, check out their other delicious adult gummy vitamins for joint support, bone health, men’s and women’s health, cardio support and even immune support. PreNatal Plus: PreNatal Plus is packed with whole-food nutrients for mommy and baby alike. The organic multi-vitamin blend contains fruits, vegetables, flax seed and a natural blend of B-vitamins, ensuring that you and your baby have all of the nutrients you need. The Berry Garden Blend of fruits and veggies also support healthy estrogen production, metabolism and breast health, so you can be as healthy as possible for your baby. B Beautiful: B Beautiful is a hair, skin and nails formula, but with its potent blend of whole-food B vitamins and co-nutrients to support brain and immune health, its beauty is way more than skin deep! Along with a full RDA serving of all of your B vitamins, B Beautiful also contains a powerful wellness blend that includes calcium, flax seed, ginger, mushrooms and antioxidants to enhance immune support. With its great-tasting green apple flavor, you’ll have to keep yourself from eating the whole bottle in one sitting! Chewable Digestion Probiotics: We all know how important probiotics are for digestion, detoxification and even immune function, but those who hate swallowing countless acidophilus pills can now rejoice, because Chewable Digestion Probiotics are an awesome-tasting way to get 6 live strains of probiotics, as well as a stabilizing whole-food blend to help your body maximize the probiotics. Utilizing Dr. Shahani’s proven probiotic blend, Digestion Probiotics provides 2 billion colony-forming units in 2 great-tasting chewable tablets. At Horizon Health Shop, we strive to bring you the best products available. Some of our favorite products are from Metabolic Maintenance, one of the highest-quality lines on the market. Based on the most cutting-edge research, these supplements are free of all binders, preservatives and artificial ingredients. Check out our 5 best-selling products below, and see the whole line for yourself here. 5-HTP: 5-HTP is an important precursor to serotonin and melatonin, two chemicals which regulate mood, anxiety, sleep and pain sensation. This 5-HTP is derived naturally from the seeds of the African plant Griffonia simplicifolia, and is combined with vitamin B6, which helps your body metabolize serotonin. 5-HTP has also been shown to help reduce appetite. It’s available in 50 mg (60 count and 120 count) and 100 mg (60 count and 120 count) doses. 5-MTHF: L-Methylfolate (or 5-MTHF) is a more bioavailable form of Folic Acid that’s able to cross the blood-brain barrier. It’s great for supporting healthy cardio, mood and nerve function, and essential for proper conversion of homocysteine to methionine, which has been linked to lower rates of atherosclerosis. It’s available in 10 mg, 5 mg and 2.5 mg potencies. Alpha Lipoic Acid: Alpha Lipoic Acid is a powerful antioxidant that’s used to treat the nerve-related symptoms of diabetes, as well as eye-related disorders. It supports healthy nerve function, and also helps restore levels of other antioxidants, such as Vitamin E and Vitamin C (just like our friend Glutathione), which is great for detoxification. It’s available in 100 mg and 300 mg dosages, depending on your antioxidant needs. CoQ10: CoQ10, also known as ubiquinone, is another powerful antioxidant that’s important for many bodily functions. Found in every cell of your body, CoQ10 is used by your body for cell growth and maintenance. Aside from its antioxidant properties, CoQ10 also helps your body digest food, and helps protect heart and skeletal muscles. CoQ10 has also been shown to help boost your recovery time after a tough workout. With so many important functions, it’s no wonder that this is one of our best sellers. It’s available in capsules (50 mg, 100 mg and 200 mg) and a great-tasting orange-flavored powder. DIM Complex: Diindolylmethane (DIM) is a molecule formed in the body when cruciferous vegetables, such as broccoli, cauliflower and cabbage are eaten. DIM, along with a related chemical, indole-3-carbinol, are thought to help protect the body against breast, uterine and colorectal cancers by acting as a catalyst to increase estrogen breakdown. The DIM complex also contains a full spectrum of antioxidants and amino acid precursors to aid in detoxification and cancer prevention. Now that we’ve covered our top 5 bestselling Metabolic Maintenance products, check out the full line from Metabolic Maintenance, and see if your favorite supplements are available in this cutting-edge, high-quality line. When most people think of cold and flu season, they think of winter, but sickness can hit even in the summer, and the body aches, stuffiness and fever that accompany it can feel even more miserable when everyone else is out enjoying the sunshine. Don’t miss out on any of that precious pool time, and boost your family’s immune system with Sovereign Silver, now in a new 32 oz. family-sized bottle. Silver has been used for centuries for its antibacterial and anti-viral properties, and now you can bring this trusted technology to your family with a safe, effective 10 ppm concentration. The microscopic size of the particles allow for easy absorption and excretion from the body, and means that even at a smaller concentration, Sovereign Silver is still highly potent. Herodotus (The Father of History) describes how the King of Persia carried boiled water with him in silver flagons to prevent sickness. During the Middle Ages, upper-class Europeans used silver goblets and utensils, which may have contributed to lower rates of disease and death from the Plague. It’s thought that the overexposure to the silver in their utensils is where the term “blue bloods” comes from. During the wars with Napoleon, the armies of Tsar Alexander used water casks lined with silver to clean drinking water from rivers and streams. This practice by the Imperial Russian army was continued through World War I, and by some units in the Soviet Army in World War II. In the Old West, cowboys and pioneers used to put silver coins into their water barrels to rid the water of bacteria. In the 1960s, NASA created a portable water purifier that used silver ions to kill bacteria and purify water on the Apollo spacecraft. Missing Your One World Whey? 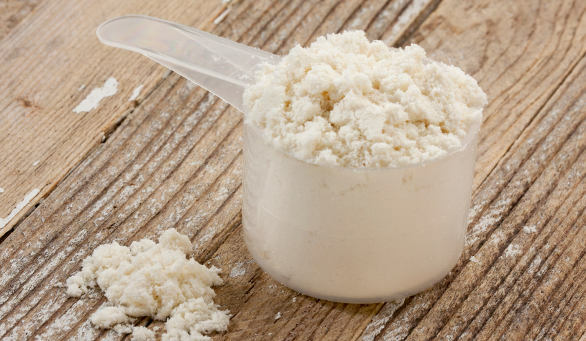 Try These 3 Protein Powders Instead! If you were using One World Whey to boost your Glutathione levels, our ReadiSorb Liposomal Glutathione is a powerful supplement containing more than 400 mg of bioactive Glutathione per serving. If you were using One World Whey to add amino acids to your diet, our Balanced Amino Maintenance (BAM) Powder from Metabolic Maintenance contains free-form amino acids in ratios that scientists consider to be the most perfect protein found in nature. Metabolic Detox Complete is the perfect supplement for those on detoxification or elimination diets, and provides a well-rounded micro- and macronutrient base. Metabolic Detox Complete is a vegan, gluten-free and dairy-free blend of pea, rice and hemp proteins that also contains medium-chain triglycerides, omega-3 fatty acids, vitamins, minerals and essential amino acids, including N-Acetyl Cysteine, a precursor to Glutathione that facilitates liver detoxification and fights free-radicals. Each two-scoop serving of Metabolic Detox Complete contains 21g of protein, 8g of fiber and only 3g of sugars, making this a great snack or meal-replacement even if you’re not on an elimination diet. Metabolic Detox Complete is available in Chocolate and Vanilla 21-serving jars, and convenient on-the-go packets. Balance is a vegetarian, dairy-free and gluten-free nutritional shake with a full panel of vitamins, antioxidants, herbs, digestive enzymes, probiotics, and fruits and vegetables to provide one of the most complete meal-replacement options out there. Each two-scoop serving contains a whopping 25g of vegan pea protein and 8g of fiber to keep you feeling fuller, longer, and give you a boost of energy to start your day. Balance comes in two flavors: Chocolate and Vanilla. Feeling constantly tired? Having a hard time losing weight? Stuck in a brain fog? While everyone deals with these symptoms at least some of the time, exhibiting them all the time may be a sign of an underactive thyroid, or hypothyroidism. Hypothyroidism is when the thyroid doesn’t make enough thyroid hormones, and can be caused by goiters, Hashimoto’s disease or aging. Symptoms include weight gain, sensitivity to cold, thinning hair, dry skin and depression. 1. Up Your Iodine Intake: Iodine is the key mineral in thyroid function, and up to 40% of the population is at risk of iodine deficiency. In order to keep your thyroid working, it’s important to incorporate foods rich in iodine into your diet, such as shellfish, saltwater fish, sea vegetables (kombu/kelp, dulse or nori) and iodized salt. Low-fat dairy is also another great source of iodine. There are also iodine supplements, such as Iodoral, which provide iodine when diet can’t cover it alone. 2. Avoid Thyroid-Blocking Foods: Goitrogens are foods that contain chemicals which lower your thyroid’s ability to produce hormones. These include cruciferous vegetables—such as broccoli, cabbage, cauliflower, brussels sprouts and kale—peaches, almonds, pears and spinach. While cooking these foods deactivates the goitrogens contained in them, it’s recommended that those with hypothyroidism limit their intake to once or twice a week. 3. Exercise: Exercise provides many huge benefits, as we all know, but it also helps maintain your thyroid function. A daily walk or run can help boost thyroid production, but at least 3 workouts a week is needed to see real improvement. 4. Natural Thyroid Supplements: While only your doctor can put you on a prescription thyroid medication if you have hypothyroidism, there are many natural thyroid supplements which can help your thyroid perform at its optimal rate, even if your hormone levels are normal on a blood test. Thyroid Care by Innate Response is a synergistic combination of nutrients, herbs, and trace mineral-rich foods that strengthen thyroid function naturally. Thyroid Complex from Transformation Enzymes is a formulation of thyroid gland concentrate and essential herbs to promote a balanced metabolic activity level and the regenerative capabilities of the thyroid. Medix4Life’s Thyroid formulation is an advanced stem cell product that supports intercellular communication and tissue regeneration of the thyroid.